“PARENICA.” The word was spoken with reverence by nearly everyone we met in the Stiavnica Mountains. They would say it with a jealous look in their eyes, “Oh, you will go to the Parenica?! ?” It was a question, a statement and an exclamation point in one. But yes, a large reason for our visit to Slovakia was to visit the Kúpele Sklené Teplice spa and it’s world-famous Parenica. What is the Parenica at Kúpele Sklené Teplice? And why does it generate such reverence from the local population? We quickly learned the Parenica is a natural steam cave bath where hot water pours from the limestone wall into a pool of hot water. The pool is a constant 42 degrees Celsius (107.6 degrees Fahrenheit). 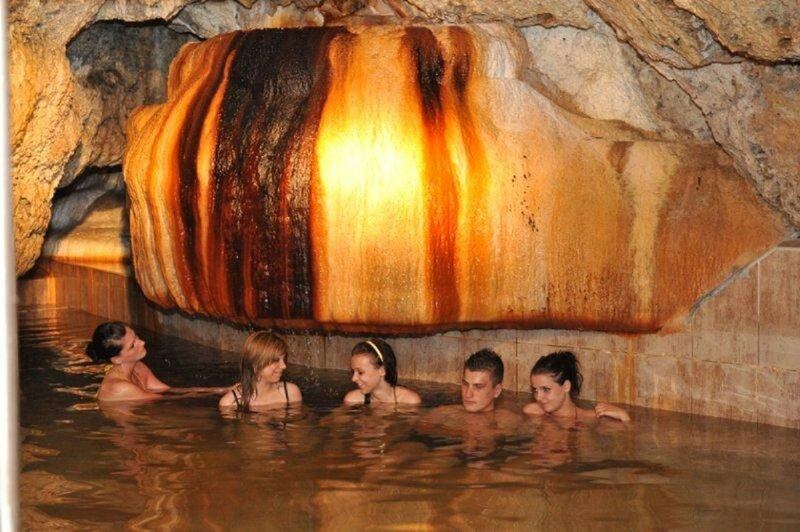 The steam cave bath at the Kupele Sklene Teplice spa is unique in all of Europe. The mineral formation left by the leaching water is a large, bright orange rounded mass that resembles a wheel of aging cheese – hence the name Parenica. In Slovak, Parenica is the name of the local semi-firm, mustard-colored yellow cheese common to central Slovakia. It’s the kind of play-on-words that locals just seem to love. 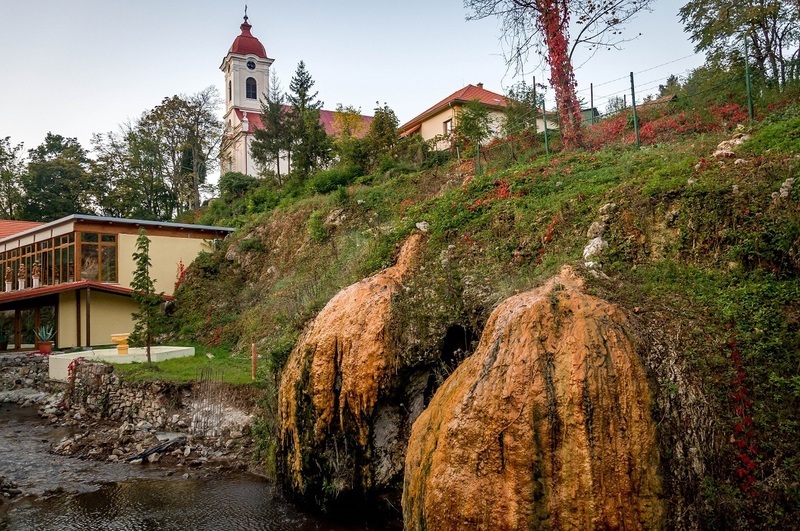 Throughout much of Central Slovakia, the mountainous geology yields a significant amount of geothermal activity. Along with the many hot springs in the area, a robust spa culture has developed. 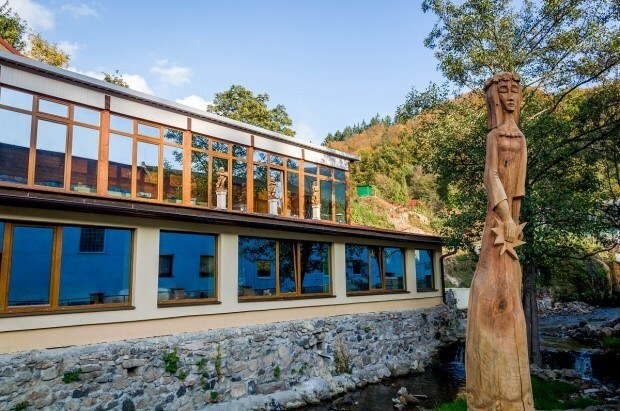 The Kúpele Sklené Teplice spa sits along the stream in the valley between two large tree-covered hills. One of the hills has a significant geothermal heat source rising within it that produces the natural hot springs. Historically, 30-40 springs have been traced to this small village area, but today, 14 are considered active, including the famous Sklené Teplice Parenica steam cave bath. We also saw several other springs cascading over mineral limestone walls and down into the stream – much to the delight of the ducks who gather in the warm stream. The Kúpele Sklené Teplice spa operates as a health, wellness and medical facility in Slovakia. 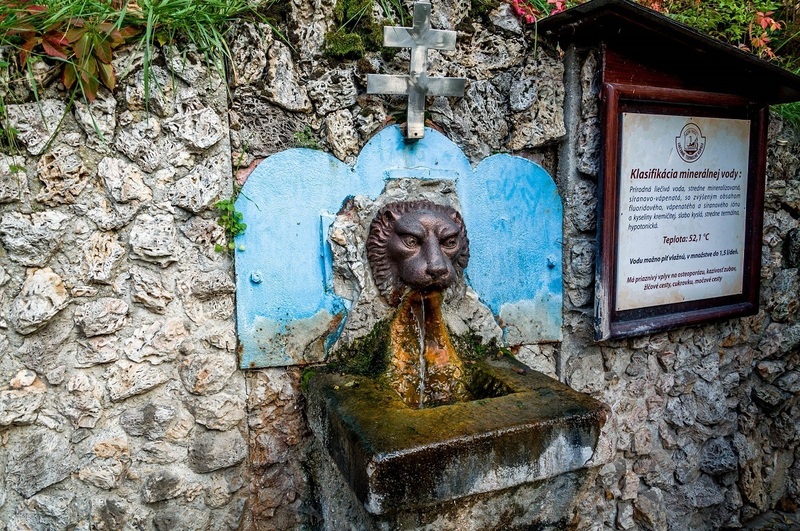 The healing waters at Sklene Teplice are both for bathing and for drinking (guests use glasses to drink the warm water from a lion’s head fountain – 1.5 liters is recommended per day). Guests come for two to 88 days to rest in the valley and receive restorative medical treatments. About half the visitors come to the spa via Slovak national health insurance and half come as private pay – all staying in the five guest houses. 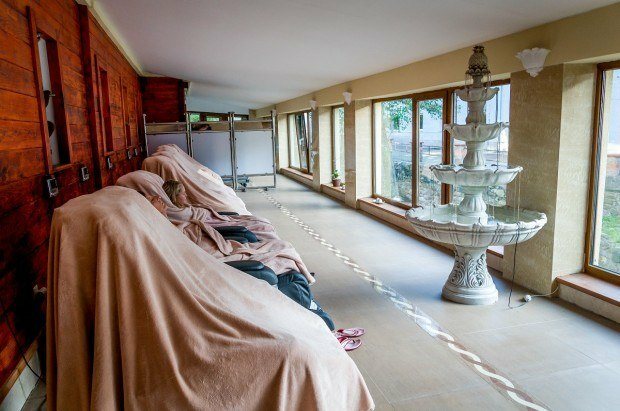 The focus at Kúpele Sklené Teplice spa is on recuperation and restorative health for locomotive and nervous disorder conditions. 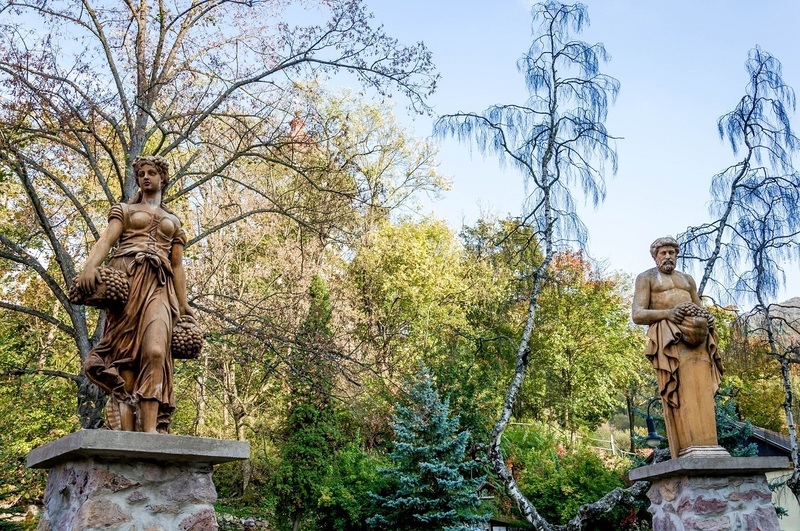 However, in recent years (and post communism), the spa has been welcoming guests for “Romantic Relaxing Weekend” packages and other getaways. The first references to the small village of Sklene Teplice date from the year 1340 when it was founded by Glaser Filius Gerhardi de Doplicze. 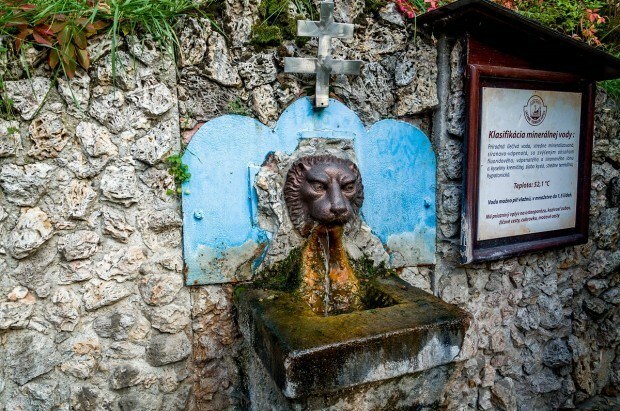 The first recorded reference of the hot spring waters and their healing benefits came from Juraj Wernher in 1549. Since that time, the thermal springs were used for both health and industrial production. In 1701, an “aristocratic” bath was built and the community of Sklene Teplice was on the map. Travelers from as far away as England visited the spa and soaked in its healing waters. The spa achieved historical notoriety on August 27, 1786 when the world’s first academic scientific congress was held at the spa and attended by the world’s intellectual elite, including the author Johann Wolfgang von Goethe. 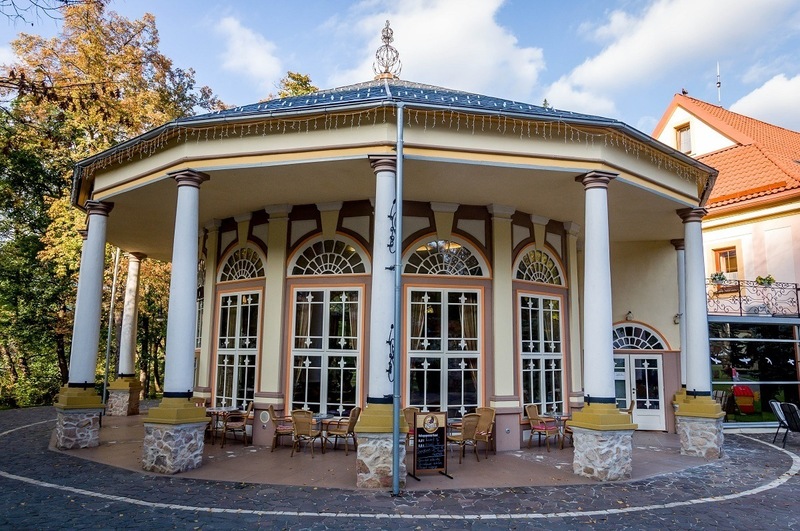 Today, the Kupele Sklene Teplice spa is designed in the art nouveau style that was popular in the early 1900s. 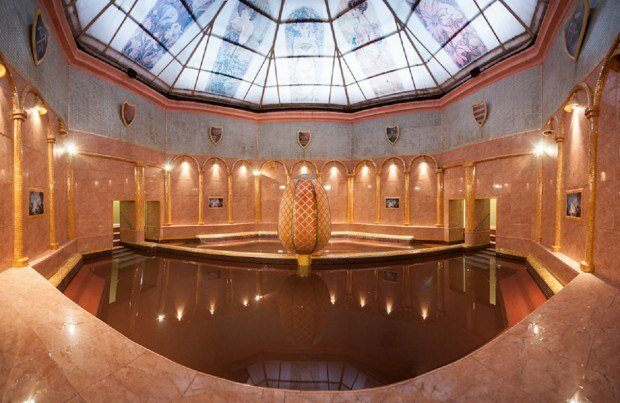 The spa culture is alive and well in Sklene Teplice, Slovakia! We visited hot springs and thermal spa on a breezy fall day. We checked into the main office and headed to the cave baths building. Everything at Sklene Teplice runs on a timed system. 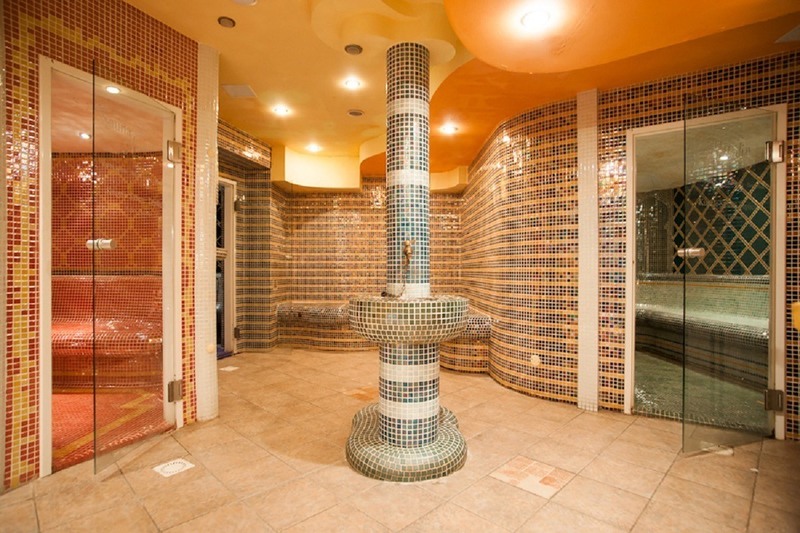 Access to the spa building is allowed only three times per hour (at 20 minute intervals). In the waiting lobby, there were lockers for our jackets, bags and shoes. At the appointed time, we were allowed into a small co-ed changing room, before taking brief showers (separately) and into the Parenica steam cave bath. The water in the Sklene Teplice Parenica pool is HOT. It is 42 degrees Celsius (107.6 degrees Fahrenheit) hot. But it felt great! The small little cove on the left side is a natural sauna – the steam gets trapped in the alcove and I felt like a little pierogi being both steamed and boiled! The spa attendants keep a watchful eye on the time and called us out at 20 minutes. Compared to other spas where you can lounge for an unlimited time we wondered about how this timed system would work. However, after 20 minutes in the Parenica, I can report we were ready to leave. It was that hot. We were moved into a calming room to be wrapped up in a blanket to cool off and relax to the sounds of the ambient spa music. I’ll confess to dozing at one point for a few minutes. After 20 minutes, were promptly moved into the solarium and placed in large massage chairs for a thorough working over, while we enjoyed the views of the autumn leaves falling outside in the stream. 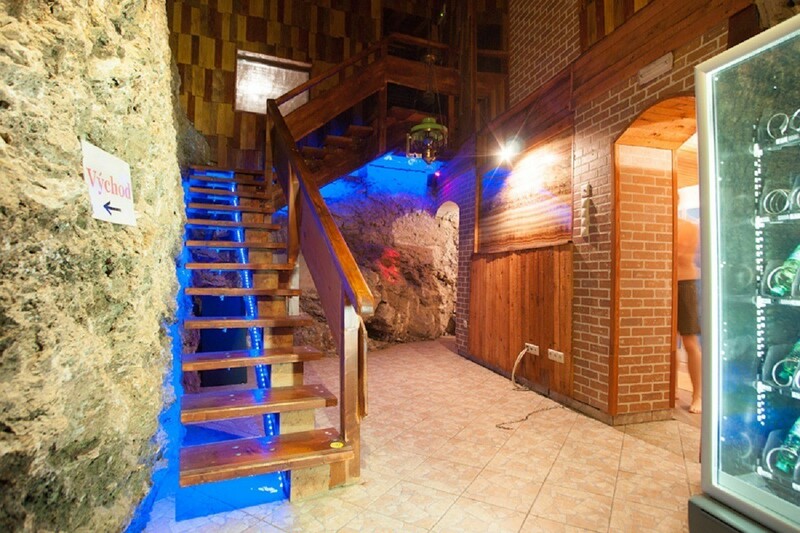 Packages: The Kupele Sklene Teplice spa offers various packages. 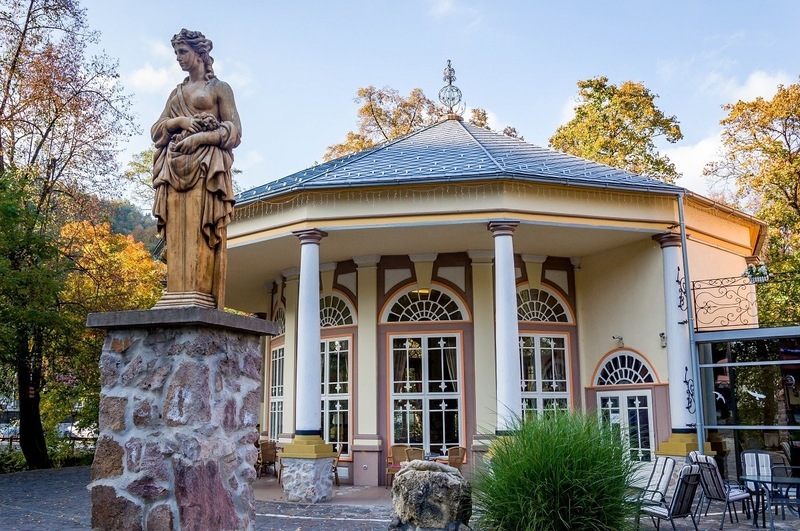 For example, the “Romantic Relaxing Weekend” package includes a full board, two night stay in the Goethe House along with several treatment packages for €66-77 per person (depending on the room and season). Spa Services: A wide variety of spa procedures are available via an a la carte menu. For example, a 30 minute classic massage is €15, a 60 minute Thai massage is €33, and a 20 minute mud wrap is €5.70. 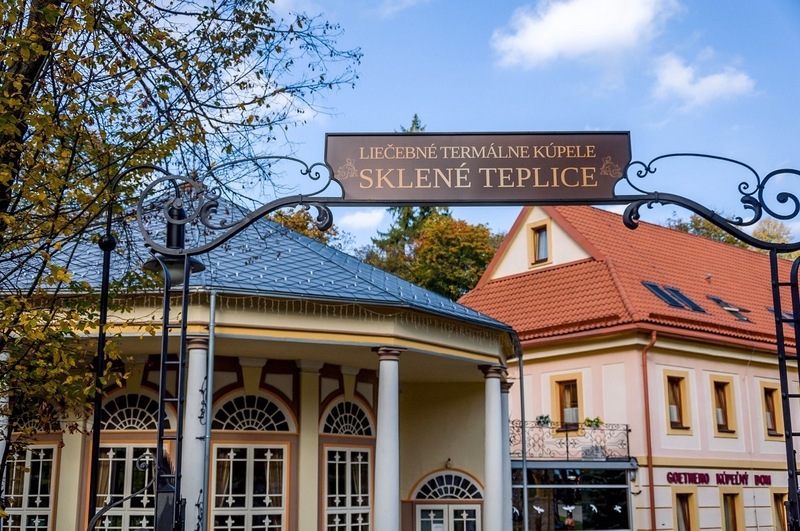 The Sklene Teplice spa has a lengthy menu of options available. Compared to other spas we’ve visited, the prices are very reasonable. Meals: The full board option includes a selection of five dishes. Half-board options ae available for €3 discount. Booking and payment: Reservations made on the website will receive a 5% discount. All prices do not include VAT. Payment can be made with Visa and Mastercard. Children: Children are allowed, but there are restrictions on which pools they can use. Skupina = group or groups. Akcie = share. For example, prices for the rooms on a share basis. We were the grateful guests of the Slovak Tourist Board. As always, all opinions are our own. All photography is our own, unless otherwise noted (Kúpele Sklené Teplice provided some photography to us). What do you think about Relaxation at The Kupele Sklene Teplice Spa in Central Slovakia? wow this looks very relaxing indeed, wish I had the time to enjoy somewhere like this. Looks so relaxing and amazing!!! I would love to get to Slovakia to experience this! This sounds so amazing! I want to go!! It was indulgent in the best of all possible ways, and yet not over-the-top or touristy. Everyone there was from the local area, and I’m fairly certain we were the only English speakers. 42 DEGREES CELCIUS that’s way too hot! Ha, even if they let me stay for longer than 20 minutes I know I wouldn’t want/be able to! But the cooling wrap and massage that follow sound lovely!